John Cabot in tradeetional Venetian garb bi Giustino Menescardi (1762). A mural pentin in the Sala dello Scudo in the Palazzo Ducale, Venice. 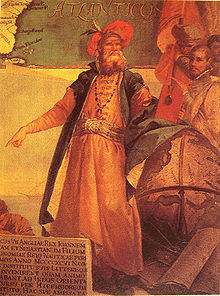 John Cabot (Italian: Giovanni Caboto, Venetian: Zuan Chabotto; c. 1450 – c. 1500) wis a Genoese navigator an explorer whase 1497 discovery o pairts o North Americae unner the commission o Henry VII o Ingland is commonly held tae hae been the first European sploration o the mainland o North Americae syne the Norse Vikings' veesits tae Vinland in the eleivent century. ↑ "Catholic Encyclopedia "John & Sebastian Cabot"". newadvent. 2007. Retrieved 17 May 2008. This page wis last eeditit on 5 Apryle 2017, at 01:11.